Unlike traditional binary computing that uses bits in either a 0 or 1 state, quantum computing uses quantum bits, which can be in superpositions (states can be added together to form a valid state). Quantum computers would, theoretically, be able to efficiently solve problems that are not practically feasible on current, binary-based computers. The IBM Quantum Experience is a cloud-based access platform for research. The University College London Hospitals teams with Glassworks to create HeartWorks. 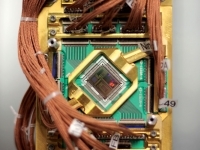 A single quantum computer could speed through problems that currently require entire data centers to solve, reducing operating costs.